My question is about slavery in the Torah. Why did the Torah allow it? It bothers me, though I know there must be some explanation. Once in a while a question comes along that gets to the core of everything. Then along comes some smart-aleck to provide an answer and wash the whole thing away. Questions such as these are not just holes in the ground waiting to be plugged up. They are invitations to spelunk deep beneath the surface, traveling all the way to the bedrock of our beliefs, challenging basic assumptions and redefining the landscape. Your question is one of those bedrock questions: After all, isn't slavery the antithesis of Torah? Torah begins with the creation of Adam in the Divine Image. The central event of the Torah narrative is the liberation of an entire nation of slaves from a cruel oppressor. Torah is about liberty, human dignity and respect for our fellow citizens of this planet for which the Creator cares so much. More than Torah is Man's discovery of G‑d, Torah is G‑d's discovery of Man and his world. How can that same Torah that makes us kind permit oppressive labor of a fellow Divine Image? You'll note, too, that as soon as the Ten Commandments are done with, where does the Torah begin legislating? "If you will have a maidservant..."--with the rights of the most easily oppressed citizen, a young girl working in your home. Let me point out another powerful weapon of social upheaval that the Torah espouses, especially through the medium of King David's collection of psalms: The Divine CEO open-door policy. A.k.a. "personal prayer": Any individual, indeed, any living creature, can at any moment, for any complaint, cry out to the Master of the Universe and his/her/its petition will be heard and acted upon. Guaranteed. "This poor man cries out and G‑d listens." You may not have thought about this, but those may just be the most radical, subversive and revolutionary words in history. Whereas the kings and priests of old would have their subjects believe that life is a grand chain of command with yours truly on top and you scum on the bottom, this idea of personal prayer flattened all hierarchies: Everyone is equally close to the top of the ladder. Torah is not just about liberty, Torah liberates in a radical way. Yet here you have these laws about buying and selling slaves. What's going on? Okay, they're not really slaves. Slaves are people owned by other people. In Torah law, you never have complete ownership over anything. These slaves rest on the seventh day and Jewish holidays, cannot be physically or sexually abused and are obligated in many mitzvot. So they are really more like indentured servants. But that certainly does not answer our question: Why should any human being be deprived of rights and privileges that others have? Such as the right to live wherever they please, work for whoever they wish to work and quit whenever they want? How does this divvy up with the Torah's assertion that every human being bears the Divine Image? Yes, there's tension here, and as every good dramatist and massage therapist knows, tension is a good point to play with. The place we're going to start is Maimonides' Laws of Servants. Being the reckless, impatient souls that we are, we'll start from the very last words. (You may ask, "Why the obsession with Maimonides? Is he the only authority on everything?" No, he's not. But he's usually a great place to search for answers. Maimonides wrote the only codification of the entire gamut of Jewish law-the Mishnah only includes those matters that were not common practice and could come to be forgotten. And the Shulchan Aruch includes only those matters that apply in the time of exile. And he wrote in a concise style with great precision. It is permissible to work a non-Jewish servant harshly. Yet, although this is the law, the way of the pious and the wise is to be compassionate and to pursue justice, not to overburden or oppress a servant, and to provide them from every dish and every drink. The early sages would give their servants from every dish on their table. They would feed their animals and their servants before sitting to their own meals. Does it not say (Psalms 123:2), "As the eyes of the servant to the hand of his master; as the eyes of the maid to her mistress [so our eyes are towards the L-rd our G‑d...]"? So, too, you should not denigrate a servant, neither physically nor verbally. The Torah made him your servant to do work, not to be disgraced. Do not treat him with constant screaming and anger, rather speak with him pleasantly and listen to his complaints. Such were the good ways in which Job took pride when he said, "Did I ever despise the judgment of my servant and my maid when they argued with me? Did not my Maker make him, too, in the belly; did not the same One form us both in the womb?" For anger and cruelty are only found among other nations. The children of Abraham, our father—and they are Israel, to whom the Holy One, blessed be He, has provided the goodness of Torah and commanded us righteous judgments and statutes—they are compassionate to all. This is one of the attributes of the Holy One, blessed be He, that we are commanded to emulate (Psalms 145:9): "And He has compassion for all He has made." Furthermore, all who have compassion will be treated compassionately, as was stated (Deuteronomy 13:18), "He will give you compassion and He will have compassion upon you and multiply you." Reading superficially, you might imagine that Maimonides is presenting us with little more than apologetics. He seems to be saying, "The Torah says we can be real mean, but that's not nice, so we don't do that." --which Maimonides himself counts as one of the 613 mitzvahs of the Torah (Book of Mitzvot, Positive Commandment #8). And then the same Torah says, "But you're allowed to be nasty to your slaves"! The tension screws tighter: Why are we kind and compassionate? Because "the Holy One, blessed be He, gave us His Torah." So how can that same Torah that makes us kind permit oppressive labor of a fellow Divine Image? How about a little consistency over here? Why can't the Torah start outright with the laws of servants, "If you have people working for you, you must treat them as equals. You must talk to them in a pleasant voice, listen to their complaints, feed them the same food you eat, provide employee benefits, regular vacations, perks and incentives, great office parties, stock options in the company, in-house professional massage therapy at lunch break and a sushi bar on every floor. If you don't like it, do the work yourself." Why not? Because that would undermine the purpose of Torah. As we discussed, Torah is a radical element in our world. Torah is that which says, "This is not the way things are supposed to be. Do like this. Not like that." That's why Torah had to be given--we couldn't just figure it out on our own. Because to effect real change it must come from "outside the system." On the other hand, Torah is the essence of all things. As the sages called it, "the blueprint of the universe." So the Torah effects change not by imposing an exogenous order, but by revealing the inner, hidden order latent within all things. Torah is very much like a good teacher, one who shows you who you really are—which may be very different, even the opposite, of who you think you are. The Torah effects change not by imposing an exogenous order, but by revealing the inner, hidden order latent within all things. So the Torah, of necessity, has two faces. Unlike human wisdom which has one face. Human wisdom must either reject or accept the status quo. But Torah is a voice heard from beyond—and so it may have two faces at once. On the one hand, the Torah speaks from a future that has yet to occur, inspiring us with its vision, pulling us toward that time. On the other hand, the Torah must deal with the world as it is, not artificially imposing upon it a foreign mold, but bringing it on its own from the place it stands by nature and circumstance to the place it truly belongs. Take an agrarian society surrounded by hostile nations. Go in there and forcefully abolish slavery. The result? War, bloodshed, hatred, prejudice, poverty and eventually, a return to slavery until the underlying conditions change. Which is pretty much what happened in the American South when the semi-industrialized North imposed their laws upon the agrarian South. And in Texas when Mexico attempted to abolish slavery among the Anglophones there. Not a good idea. Better idea: Place humane restrictions upon the institution of indentured servitude. Yes, it's still ugly, but in the meantime, you'll teach people compassion and kindness. Educate. Make workshops. Go white-water rafting together. (Hey, why didn't Abe Lincoln think of white-water rafting?) Eventually, things change and slavery becomes an anachronism for such a society. Which is pretty much what happened to Jewish society. Note this: At a time when Romans had literally thousands of slaves per citizen, even the wealthiest Jews held very modest numbers of servants. And those servants, the Talmud tells us, were treated better by their masters than foreign kings would treat their own subjects. So the "conservative-radical" approach of Torah is this: Work with the status quo to get beyond it. Torah is more about process than about content. Are you satisfied with this answer? I'm not. I'm convinced there's a deeper effect that Torah is looking for. Call it "the participatory effect." A.k.a. nurture. The Participatory Effect tells us that if you want people to follow rules, you put guns to their heads. But if you want them to learn, grow, internalize those rules and be able to teach them to others, you're going to have to involve them in the process of forming those rules. School teachers do this when they work with their class on the first day to design rules that everyone will see as reasonable and useful. Parents do this when they allow their child to makes mistakes so that s/he will learn from them. A skilled wife is doing this when she gets her husband to believe that he came up with the idea of re-tiling the kitchen floor. In general, this strategy comes more naturally to women than to men. Men find it much easier to shove their opinions down other people's throats and, if need be, argue the other into the ground until he surrenders. All variations of the old gun-to-the-head technique. Women are designed to nurture, physically and emotionally, so they take naturally to the participatory technique. To quote Gluckel of Hameln, "She was a true woman of valor. She knew how to control her husband's heart." In Torah, both the masculine and the feminine approaches exist—they're called "The Written Torah" and "The Oral Torah." The Written Torah (principally, the Five Books of Moses, but also including all the Prophets and Scriptures) lays down the law in a fatherly, authoritarian voice. It says: "These are the rules. They are for you own good, whether you understand that or not. I only made them because I love you so much. If you don't like them, just remember that I'm a lot bigger than all of you put together." Then along comes the mother of us all, the Oral Torah. Although the Oral Torah includes many fixed traditions—some originating from Moses and even earlier—the bulk of the Oral Torah is our own participation in the process of Torah. The Written Torah itself empowers us to discuss matters, expand on that which we have received, extrapolate and make decisions accordingly. It was concerning the Oral Torah that Rabbi Yehoshua ben Chanania declared, "The Torah is not in heaven." It is here, within us, in our struggle to fathom the depths of our received tradition and in our ability to take Torah to the next step. Of course, that doesn't mean we can make up whatever sounds nice to us and call it Torah. There are rigorous guidelines and a firm set of criteria for a novel idea to be considered Torah. We're dealing with a delicate ecology here—you have to understand the landscape very well before building a highway here and damming a river over there. But what it does mean is that when you are working through a Torah idea, doing all that examining and letting the creative juices pour (within the guidelines mentioned above), those ideas within your brain and those words that you are speaking are no different than G‑d declaring, "I am the L-rd your G‑d, etc." at Mount Sinai. When you are working through a Torah idea, those ideas within your brain and those words that you are speaking are no different than the words of the written Torah themselves. As those Talmudic sages put it, "Any new idea a qualified Torah student comes up with was already given to Moses at Sinai." The idea is new, but it's still Torah. It's new, because until now it was hidden deep within the folds and creases of the package Moses delivered. It's Torah, because all the qualified student did was unfold the package and smooth out the creases. So if I come up with one of those bright Torah ideas one day, is it my idea or is it Torah? It's both. In the Oral Torah, we and G‑d become one. So you can see where I'm getting to with the slavery thing. If G‑d would simply and explicitly declare all the rules, precisely as He wants His world to look and what we need to do about it, the Torah would never become real to us. No matter how much we would do and how good we would be, we would remain aliens to the process. So, too, with slavery (and there are many other examples): In the beginning, the world starts off as a place where oppressing others is a no-qualms, perfectly acceptable practice. It's not just the practice Torah needs to deal with, it's the attitude. So Torah involves us in arriving at that attitude. To the point that we will say, "Even though the Torah lets us, we don't do things that way." Which means that we've really learnt something. And now, we can teach it to others. Because those things you're just told, those you cannot teach. You can only teach that which you have discovered on your own. History bears this out. Historically, it has been the Oral Torah, rather than the Written Torah, that has had the greatest impact on civilization. As much as Rome ruled over Judea, Jewish values deeply transformed Rome. One of the results was the legal privileges eventually granted to slaves and the gradual recognition of the value of human life. Torah involves us in arriving at the right attitude. And now, we can teach it to others. Because you can only teach that which you have discovered on your own. For over a thousand years, the Church managed to subvert the message of Imagio Deo—that every human being is G‑dly—despite the repetition of the concept in the Genesis narrative five times. It wasn't until the Italian Renaissance that a new Humanist spirit dawned and the idea could no longer be repressed. "The Oratory on the Dignity of Man" is often touted as the manifesto of the Renaissance and early Humanism. It was composed by Giovanni Pico della Mirandola. It's no secret that Pico studied under the greatest rabbis of his time and was obsessed with the Zohar and Kabbalah. There are many more such examples. The greatest force in the emancipation of slavery in colonial times were the "Society of Friends," also known as the "Quakers." Historians discuss the phenomena of the Quakers in the context of the "Hebraizing of Christianity." Again, their leaders were deeply influenced by readings of the Kabbalah in translation and by humanists who had learned their ideas from rabbinic sources. The history of emancipation is complex and long—and viciously controversial. In truth, Jews took roles on both sides of the prickly fence. Aaron Lopez, a convert to Judaism, brought slaves on some of his ships to America. On the other hand, Baron Nathan de Rothschild and Sir Moses Montefiore made possible the great Slave Emancipation Act of 1835 by granting 20,000,000 pounds sterling in loan subsidies. In the struggle, eventually the true Jewish spirit prevailed and it is those values that Maimonides espouses that eventually became dominant in our society. August (Anshel) Bondi was born in Vienna, Austria July 21, 1833. He was the son of Jews who wanted him to have both a religious and a secular education. Caught up as a participant in the failed liberal revolution of 1848, the Bondi family fled to New Orleans and settled in St. Louis, Missouri. Young Bondi encountered, first hand, the horrors of slavery and was deeply disgusted. In 1855 a New York Tribune editorial urged freedom-loving Americans to "hurry out to Kansas to help save the state from the curse of slavery." Bondi responded immediately. He moved to Kansas and along with two other Jews, Theodore Weiner from Poland and Jacob Benjamin from Bohemia, established a trading post in Ossa-watomie. Their abolitionist sentiments very soon brought pro-slavery terrorists upon them. Their cabin was burned, their livestock stolen. Their trading post was destroyed in the presence of Federal troops who did nothing. The three courageous Jews joined a rabid local abolitionist, to defend their rights as citizens and to help rid Kansas of the horrors of slavery. The Jews joined the Kansas Regulars under the leadership of John Brown. Aren’t Moses’ and Mohammad’s Stories Similar? What Is the Jewish Perspective on the Bible Codes? Why Toil in My Torah Studies? The Rabbi states "That's basically what slavery was" —labor in return for food and lodging. " That argument is an apologia for modern slavery ignoring the fact that slavery means profit to the slave users. 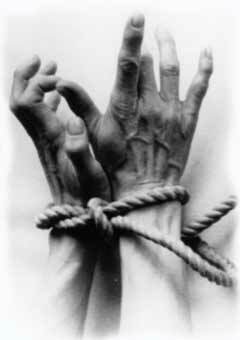 We in UK now have The Modern Slavery Act 2015 prompted by the fact that modern slavery is an international crime affecting an estimated 40.3 million slaves around the world.. Then if Torah had given us a clear condemnation of slavery instead of good management advice ,neither Christians or Muslims who pay lips service to Torah could have ignored it and ,then The Modern Slavery Act 2015 after 3000 years may not have become necessary. In the end it all boils down to the question - is the Torah as it has come to us the perfect and unadulterated word of Hashem ? If you believe it so to be - then your hands are tied and your mind is set, if you see an internal moral conflict it's only because you are confused. However if you believe that the hand of man can be seen in Torah then the apparent conflict is resolved. There are some fundamentally misleading arguments here that any student of history should immediately recognize. "Judaism is a religion…founded around an extensive caste base." This could be argued only if one could demonstrate that Torah ensconces slavery as a fundamental institution. It is blatantly obvious that quite the opposite is true. The focus of Torah on the institution of servitude is principally in terms of limitations of the powers of the master over him, and the preservation of the servant's dignity. Passover is presented as a remembrance of our humble beginnings as slaves, and a celebration of release from slavery. We see here not the establishment of caste, but a determined agenda to undermine the caste mentality. A thorough discussion of the concept of citizen (as opposed to the "subject" of typical caste systems) can be found in Joshua Berman's "Created Equal." See also the discussions of Geoffrey Hosking, who agrees with Berman that the concept of citizenship originated in ancient Israel. The argument that Torah is an ideology of conquest is also spurious. The conquests instructed by Torah are explicitly limited to their particular circumstances. As a people, we never understood these conquests to be a directive for the likes of universal military jihad. In many ways. Imagine living an era when each nation is attempting to grab as much territory as it can, an era of constant war. To survive, you must live in a walled city. But you can't build and maintain that wall while producing food without servants who work at minimum wage. That's basically what slavery was—labor in return for food and lodging. Furthermore, once you've fought another aggressor and defeated them, what do you do with them? Leave them be and they will likely attack again. Slavery was the alternative to mass murder. The Romans took slavery to the extreme—and that may well have been their downfall. In the Ancient Middle East, it was mostly a pragmatic concern. Slavery I'm well aware that slavery is really servitude, and furthermore is excused as a way to rehabilitate a thief who had stolen and can't pay back. But let's look at the alternative. The One is omniscient right? So he knew psychology and sociology. Why didn't the Torah establish social workers and occupational therapists to rehabilitate those who steal? A non-jew who becomes a slave to a Jew is an "Eved Canaani", a semi-converted jew who observes mainly the laws pertaining to jewish women (they do not observe time-bound mitzvot like tefillin, except Shabbat). Owners are obligated to treat them with kindness, provide good food, etc. & when they are freed, they become full-fledged jews, something that is not necessarily easy to achieve if someone wanted to become a Jew on their own. It's a gift given to Eved Canaani's when they are freed, like Eved Ivri's when they are freed. Rabban Gamliel had an Eved Canaani that he wanted to free (he even, by accident, knocked out the Eved's tooth & tried to use this accident as an excuse to free him), but the Eved didn't want to. @Mel Yes, you have misunderstood. I appreciate your sensitivity to the issue. I also think you might gain more clarity if you read what I wrote objectively. Aside from the ancient Canaanites, there were other situations in which servitude was not immoral. And then there are many situations in which it was immoral. The Torah describes Non Jewish slavery in terms of not only owning a person to the point that you can put that person in your will it also allows you to sell the children of your slave. In comparison, it was common for parents to kill unwanted babies from the time the Torah was given to apx 300CE which is an expanse of apx 2,250 years among all the peoples of the known world except the Jews. The reason our ancestors didn't practice this type of murder was due to G-d telling us in the Torah not to do it. He didn't say you can do it but it's not nice. He said no and we didn't do it. If slavery was wrong He could have said no slavery. No, I have no idea what Kant's categorical imperative is about. But with a little wordsmithing your last paragraph answered my question. It is moral to sell a person as a slave with the protection of law. If I misunderstood your last paragraph which was written in the negative please let me know. Mel Mel, I'm sure you're aware that you are invoking Kant's categorical imperative as an argument: "Act only according to that maxim whereby you can, at the same time, will that it should become a universal law." If so, you must be aware that the argument is not only faulty, but dangerous. While it is true that there are absolute moral truths, it is beyond the capacity of any human being, imprisoned as he is within a specific time, culture and mindset, to determine those truths. We learned this especially from the trial of Adolf Eichmann, and indeed from all the social experiments of the 20th century. So, to answer frankly, I do not believe that it is immoral under any situation to sell a person into indentured servitude to another person who will treat him according to established law. Just as I do not believe it is immoral to kill a person under any circumstance. Or that it is immoral to steal under any circumstance. Mel Slavery is a negative word, but would you consider that when someone is hired to work somewhere, that technically he is "enslaving" himself to his employer's rules for that set amount of time? 2000 years ago, slavery was an easy means of paying off debt, and in the Torah, slaves had a lot of rights to protect them, many of which were not even considered by harboring nations. The Torah governs all of jewish life, even when, G-d forbid, when one needs to sell a child. Just because there is a permissible method to do something that is prescribed in the Torah, it doesn't mean we should jump on it in every opportunity. Take for instance kiddushin (marriage) - by Torah law, one can chat for a bit with a woman, agree in getting married, cohabit with her & the marriage would be effective (witnesses are needed, too, but that is for a lengthier dialogue). However, Rabbinically this is frowned upon and one should not do this. Your reply is not a solution. What you describe are modifications to punishments of transgressions which are permissible. You can prescribe seven payments for the transgression of one man injuring another but you cannot decide that it now is moral to injure another under the law. It was immoral 3,200 years ago to injure another person and it is so today. As such you might litigate under which circumstance you can sell off the children of a slave but you cannot decide that slavery is immoral. Do you see the problem? Mel G-d's words dictate that we should punish all sorts of transgressions with hanging, strangulation, stoning and the sword. Rabbi Akiva said that a court that puts a man to death once in 70 years is a murderer's court. At Baal Peor, G-d's word to Moses says, "Take the leaders of the people and hang them up against the sun!" Moses gathers the leaders of the people and they judge which people should be punished and which not. G-d's word says, "An eye for an eye, a tooth for a tooth." Our sages explain that's not what G-d literally means, and no Jewish court—including that of Moses or Joshua—ever did that. It means fair monetary compensation. Maimonides, as well, tells us what Jewish practice always was—compassionate. Thank G-d the Torah was given to a compassionate people, and a wise people who see past the word into the meaning beneath it. And that was G-d's intent in giving it to us, that we "listen to His voice"—His voice, and not just His word. Torah for compassionate people and uniqueness of Jews You mention that the Jews are compassionate and wise which is true. Does that exclude other people from being that as well? For anger and cruelty are only found among other nations. The children of Abraham, our father--and they are Israel, to whom the Holy One, blessed be He, has provided the goodness of Torah and commanded us righteous judgments and statutes--they are compassionate to all. This is one of the attributes of the Holy One, blessed be He, that we are commanded to emulate (Psalms 145:9): "And He has compassion for all He has made." Mel, I'm glad you're bringing that up. If we don't ask such questions, if we're not repulsed by the thought of inhumane treatment condoned by Torah, then we need to ask ourselves what sort of G-d we believe in. That is why I cited the words of Maimonides with which he concludes the Laws of Servants. In sum, he writes that "Yes, it may be permissible, but we don't do that." This is actually a common phenomenon in social history. It's a fallacy to believe that a society is described by the sum of its laws. For example, I don't know of any law in the Americas or Europe forbidding child sacrifice. Why? Because there is no need. You will find many such discrepancies between law and practice in ancient Israel. For example, polygamy is permitted, and yet a search through the entire Tanakh and Talmud turns up only a handful of cases—even among royalty. So I propose that it was always considered unacceptable among Jews to treat their servants inhumanely—as Maimonides writes. And so, there was no need for the Torah to prohibit such. Now, think of the outcome of such a system. Here you have a people who "even their sons and daughters they burn in fire to their gods." And, yes, in many parts of the world today, children are still considered the chattel of their parents, their lives of little value. And these people are now in servitude to Jews. And they know that these Jews are permitted to sell their children—but will not, because that is not humane. I believe that has a much stronger impact on these people, and on their neighbors, than a law imposed from above.
. To the Orthodox ,in whatever theology one subscribes ,this aphorism applies - but it has the sub-clause - provided always that that avenue must never lead to confrontation with your original belief. So one would become like the slave who has his ear nailed to he masters doorpost. Back to AvramJ If you are confident in your beliefs, there are no avenues of thought closed to you. Nevertheless, I cannot see how my lack of understanding is evidence to challenge divine origin. There are many things I do not yet understand. Maybe I never will. On the contrary, if I understood all of it, then I would have real doubts. How is it possible that human being could fathom the entirety of a divine teaching? What I do know is that there were many things that made no sense to me for years, until I found some answer, sometimes written hundreds of years ago, that answered everything. And I also know that, as a whole, the Torah is a wondrous document, an anomaly in every way from the standards of the ancient world. If it is not a divine document, then I cannot imagine the mortals who wrote it. As for the details of these particular laws and others like them, I doubt we can grasp them from the viewpoint of our modern world. You have to be an Inuit to understand why Inuits do what Inuits do. But you should note: In every society where there have been slaves, elderly slaves were simply "disposed of." In Torah law, murder of a servant was murder, period.